The Tokyo Organizing Committee of the Olympic and Paralympic Games decided during an executive board members meeting Monday to propose the addition of five sports to the 2020 Tokyo Games, including baseball/softball and karate. The committee’s proposal is highly likely to be accepted by the International Olympic Committee, which will hold a general meeting next summer just ahead of the Rio de Janeiro Olympics. The move would bring baseball and softball, two popular sports in Japan, back to the Olympics for the first time in 12 years. 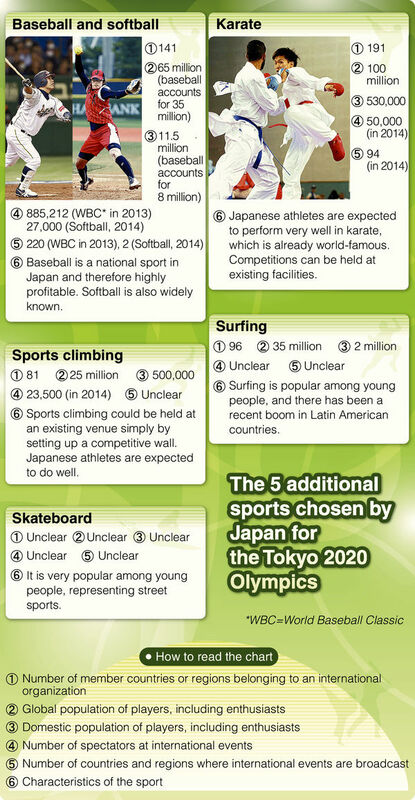 The three other sports to be proposed are skateboard, sports climbing and surfing, in keeping with the IOC’s desire to add sports that are attractive to young people. Fujio Mitarai, honorary president of the Tokyo organizing committee who chairs the committee’s panel discussing the selection of additional sports for the Tokyo Games, said those sports will make the Tokyo Games more appealing. “It will be the best opportunity to present Japan’s high interest in sports to the world,” he said at a press conference on Monday evening. Mitarai said the panel discussed three basic criteria in the selection of the sports — they must attract young people, help liven up the Tokyo Games and be chosen through a highly transparent and fair process. Under the “Olympic Agenda 2020” reforms, the IOC agreed to abolish the 28-sports limit on the Summer Games, and instead use an events-based system that would allow the addition of new competitions without increasing the current size of about 10,500 athletes and 310 medal events. Host cities are allowed to propose the inclusion of additional sports for their Games. The Tokyo Games will represent the first time these reforms are applied. In the first-round selections in June, eight sports — baseball/softball, karate, bowling, roller sports, sports climbing, squash, surfing and wushu — were chosen from among 26 sports. During the final selection round on Monday, the Tokyo organizing committee dropped bowling, squash and wushu. Men’s baseball was an Olympic sport from 1992 to 2008, and women’s softball appeared in the Games from 1996 to 2008, but both were dropped after the 2008 Beijing Games. The Japanese national men’s baseball team won the silver at the 1996 Atlanta Games, while the Japanese national women’s softball team grabbed the gold at the Beijing Games. Karate originated in Japan and has 100 million practitioners around the world. The martial art was a candidate for the 2012 London and 2016 Rio de Janeiro Games, but wasn’t chosen as an official Olympic sport for either event. The Tokyo organizing committee expects baseball/softball to liven up the Tokyo Games given their widespread popularity in Japan, but some selection panel members were concerned over whether top athletes, including Major League Baseball players, would participate in the 2020 Olympics.